The question is where do you begin? There is so much to learn all around, and so little time. This is seemingly the reason most of us would go through each day without questioning our perception of the world. We seldom stop to wonder whether the world we perceive matches the real world outside. Most of the time, that’s fine…because our perceptions serve us quite well. In fact, our perception is good enough to guide us through a very complex world with few problems. But because it serves us so well, it’s easy to forget how limited perception really is. And one reason for inadequacy of human perception is that it has to deal with an enormously complex real world. We live in a world that is not only complex but vastly older and bigger than we are. To think we can fit it all into our heads is a logical absurdity. At same time, our world and life is full of opportunities, disguised as problems and challenges, which need to be either pursued or avoided. You don’t want to spend a disproportionate amount of time analysing a single problem. Instead the strategy should be to race through numerous problems and quickly identify the solvable ones. How do you do that? By learning the mental models. If you are new to Safal Niveshak, let me explain. A mental model is a representation, inside your head, of an external reality. Mental models are the basic units which construct a person’s world view. It is the representation that a person has in his mind about the object he is interacting with. It is the way people think about what it is they are doing or dealing with. Mental models shape our actions as to how we act or behave in a particular situation. They define what people will pay attention to and how they approach and solve problems. Mental models are tools for the mind. The more models you have from outside your discipline and the more you iterate through them when faced with a challenge in a checklist sort of fashion, the better you’ll be able to solve problems. While thinking about a problem, mental models provide you a map with which you can quickly course correct your line of inquiry. These models are additive. Like LEGO. The more you have the more things you can build, the more connections you can make between them and the more likely you are to be able to determine the relevant variables that govern the situation. It won’t be an overstatement if we call these list of mental models as a cheat sheet which allows us to better understand when to follow and when to reject the conventional wisdom. So it’s very important to have the right models in your head. And how do you build these models? You don’t have to build them all on your own. According to Mr. Munger, there are about 100 or so models across the disciplines of microeconomics, physiology, psychology, elementary mathematics, hard science and engineering that carry about 90% of the freight in making you a worldly-wise person. And, of course, it’s not possible to learn all of them in day or a week or even in a single year. It’s a long term proposition and will require serious efforts. But when you’ve committed yourself to a lifelong journey for seeking worldly wisdom, it’s a small price to pay. Mental Models, Investing, and You is a 430+ page e-book (and this is just the first volume) where we have compiled 50 mental models arranged by fields of study. It covers ideas from the various disciplines including psychology, economics, business, mathematics, engineering, physics, social science, literature, statistics and decision making. We have spent last 18 months researching and writing this e-book, and the efforts were worth it given that we ourselves learned so much in the process. Apart from this, you would also end up learning the thinking strategies used by world’s best investors like Charlie Munger, Warren Buffett, Peter Lynch and wildly successful entrepreneurs like Elon Musk, Jeff Bezos, and Bill Gates. And this is not all! There are more than forty other thinking tactics and mental models you will learn from this e-book. Now what’s unique about this e-book is it doesn’t just talk about the mental models in an abstract way. For every model, you will find discussion on how it can be used to gain unique insights in investing, business, and life in general. Anyways, Mental Models, Investing, and You can serve as a good starting point for you to create your own “latticework of mental models.” The insights you’ll discover here will become the springboard for further useful discovery. How to Get This E-Book? Once you make a NEFT transfer/Cheque payment, please send us an email with your funds transfer details. Before we end, one final warning. Anything you read “rewires” a part of your brain. The brain you have now; you don’t get that brain back after learning the mental models. We are sincerely hoping that the trade-off is worth it. P.S. After you pay, please give us 24-48 hours to email it to you. For any queries, please email to vishal[at]safalniveshak[dot]com or anshul[at]safalniveshak[dot]com. I always enjoyed Anshul’s posts on Mental Models. I was thinking when this will come out as a book. Glad it came soon. Hope I add at least few of this to my mental toolkit. Great work from both of you!! thank you!! Thanks for the good work and looking to receive it. 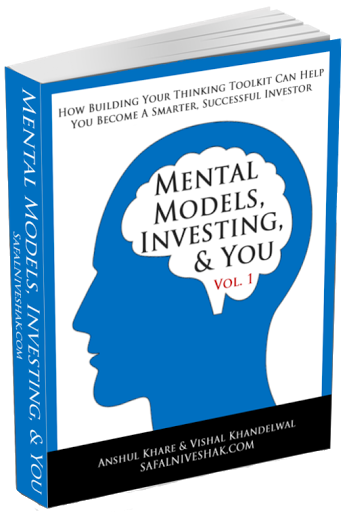 Your mental modell series is the best of all the investing subscription i get in my inbox. Well written, examples in daily life and investing. I feel I get smarter after each post from you. You ate truly giving value to your audience. Thanks Vishal and Anshul for putting this up. Cannot wait to start reading the book! Thanks for putting this together. This is priceless. How many volumes are there in total? Thanks Sathyaraj! There will be 2 volumes…so 1 more to go. Regards. I was feeling guilt from inside for receiving the teaching of Guru without paying any Guru Dakshina. I am a bit relaxed now :). Thanks a lot for sharing your valuable knowledge through your blog. I was tempted to get the e-book for free, but then I realised that I did not mind paying for good value. Just purchased the e-book. Can’t wait to read it now. Keep up the good work guys. You’re an inspiration to me and many investors out there. Glad to know that, Kanwalpreet. Thanks! I couldn’t wait for the book, so I applied it for free now. I ensure you that I will pay for it ASAP. Some folks would like a hard copy . Any plans to publish it . Not in the near future, Srinivas. I have paid and registered for the book 12 hours back. Have not yet received the e-book. Can you pls let me know the process and when can I expect to receive the book. Thanks Jitesh! You will receive it today. Not sure, which mental model/psychology phenomenon describes pricing method you guys used. For anyone like me, who is a regular follower of your blog, feels obligated to buy this ebook. Honestly, I felt bad when I thought of clicking on free link, and deliberately(with a smile on face) decided to pay for it. I think, Guy Spier and Warren Buffett both have talked about it. Keep building goodwill(offer quality stuff for long time), and then, suddenly, the curve starts to move up and it starts paying off(in a big way). Thanks for your kind words, Yogesh! Hope you like the book. Please review/rate it on Goodreads if possible. Thanks Vishal. Thank God, i am not tempted to go for Free Option! I have paid for the book via NEFT around 30 hours back. Can you please tell me when will i be able to put my hand on the master piece. Sorry for the impatience. Hi Ankit, thanks! I’ve sent you the book. Regards. Looks like the pricing strategy for the book itself applies some mental model(s)! All the best! I have applied for the free E-book 2 days back but not received the book till now. can you please arrange the same for me. Hi Manish. You must have received the ebook by now. I haven’t received ebook yet. Please check, and send me the ebook. I paid through credit card. Hi Yogesh. You must have received the ebook by now. I had registered for free ebook 2 days back. Can you pls let me know when will i receive the ebook. also can you publish book in epub or mobi format for kindle. Hi Akhil. You must have received the ebook by now. It’s in the PDF and MOBI formats. Thank you both for sharing your wisdom through this e-book as well. I have registered for free copy but till now i didn’t receive any email. Is it that we need to pay in order to get the copy? Hi Vinay. You must have received the ebook by now. What is the format of book. Can i read it on Kindle ? Yes, the ebook is available in PDF and Kindle formats. Got my copy yesterday. Completed 2 chapters and I cannot keep the book down. Awesome effort by you guys to keep it simple (it takes a lot to keep things simple). Glad to know that Parag. Thanks! Thank you very much Vishal and Anshul for coming up with this excellent piece of work. I have booked my copy via Explara on Monday and quite eager to get my hands on it (preferably Kindle format). Hoping to receive it soon. Hope you did not miss this message. Requesting you to please look into it. You should have received it by now. Please let us know. I tried downloading from the provided link but its down due to heavy traffic. That is indeed a compliment and something to cheer about. I must congratulate you for such a successful launch of the book. I sent a separate mail for any alternate link. Thanks foe sending me the new link. Time to get busy reading the book now! Thanks and Kudos to you guys for this great work of putting this worldly wisdom in a handy e-book. I’ve registered the ebook on 26th Sep but yet to receive it. Could you pls look into the same? Thanks for your kind words, Aksh! You must have received the book by now. Let us know. Regards. After so many days and repetitive reminders on both email and here through comments, I’m yet to receive even the link let alone the e-book. Can’t help but being a practitioner of mental models myself makes me think – are you guys really serious about this or its part of some sort of gimmick? Hi Aksh. We haven’t received any reminders from you. And then, we’ve already sent the book to you on 27th September. Check you spam please. Given that 2000+ people have already received the book, and that we are giving it away for free – like you have claimed the book – it isn’t a gimmick for sure. Thanks! I’ve already checked everything on my side not once but many times before expressing my concerns but even after your this very recent assurance I’m yet to receive the same. And when I’m receiving all your posts in my mailbox regularly, not getting this “free as advertised” e-book is quite strange! Isn’t it? and that’s why my concerns of it probably being some sort of gimmick. Regarding reminders, I’ve sent an email to you and Anshul on 28th so kindly do check the same and my reminder comments are already visible here. Rest, We are all mature enough to understand stuffs, so won’t be reminding/writing you any more. This is simply superb Vishal & Anshul! I am greatly moved by this completely different approach of offering the same thing for free as well as paid. People willing to pay for valuable resources when they know they can get it for a bargain is symbol of true value investors paying for quality. Thank you for sharing great knowledge and doing a good deed in parallel by donating the money to underprivileged. Thank you for increasing our inner scorecard! You Rock!!!! Thanks a lot for your kind words, Vaibhav! Regards. I purchased the book online and received a link to download the ebook. However getting the following error after clicking on the link. Please help. Dear Pradip, please send us an email and we will send the new link. Sorry for the trouble! Regards. Dear Ananth, please send us an email and we will send the new link. Sorry for the trouble! Regards. Same drop box issue with me. Hi Abhishek, please send us an email and we’ll share the new link. Thanks! It’s there in the ebook folder we have shared. Thanks! Great work, last night I downloaded..
Glad to know that, Harish. Thanks for your kind words. Regards. I paid on Monday. However, not able to download it because of same drop box issue(Error(429)). Please kindly send me the PDF copy on may mail id: Kaustav_raja@rediffmail.com. Hi Kaustav, sorry for the trouble! Have sent you the new link. Regards. I am still waiting for your ebook after payment done on 26th Sep.
Hi Santhosh, thanks! I just re-sent you the book. The ebook is awesome especially the “Business” section. Thanks a lot for that. Inside, in surfing the wave section, you have mentioned that Warren Buffet was not investing in the tech companies. Because he could not understand the it’s business. Could please elaborate on this. I am religiously following your advice to read annual report and understand the business. But still I cannot figure out what is exactly knowing the business. Please help me on this. Hey Vishal email me the link to download your e-book on mental models.Very much interested in reading your work. Have mailed you the details of the NEFT done to your mentioned account. Hi Aniket, sent you the e-book yesterday. Thanks! can you make it available on amazon so that i can download on kindle. The book is available in the kindle format also. If you have registered for the book, you would have received the link to download the book in all three formats, i.e. pdf, epub and mobi (kindle). Have you removed the free option for the E-Book? I have suggested it to so many of my friends to convince them about you guys and your voluminous work in the form of Ebook. They came back to me disappointed saying there is no such free offer. Let me know if you intend to open up the free offer again. Lot of fence sitters will become converts, so to say.